Former UFC middleweight champion Anderson Silva was initially set to face off against Kelvin Gastelum for UFC 212. However, Gastelum has since been flagged for a potential anti-doping violation by USADA. As a result, Kelvin Gastelum has been pulled from the match. Since Gastelum’s removal from UFC 212, fighters have been practically lining up to face Anderson “The Spider” Silva. Yoel Romero, Vitor Belfort and Luke Rockhold have all been discussed as potential opponents for the former champion. However, Anderson Silva is taking his time choosing his next opponent. The fighter has already turned down former champion Luke Rockhold. 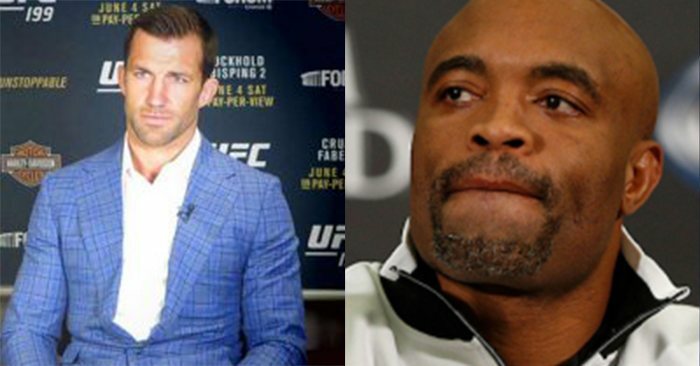 In a recent interview on Submission Radio, Rockhold explained why Anderson Silva does not want to fight him. “He made an excuse saying I’m coming off a loss and (he’s) coming off a win, but if you look at his record he’s [1-4 (1 NC)] in his last five fights, six fights and his win is questionable. So I don’t know where he is. He’s justifying that case is kind of… I don’t really understand that justification.” Rockhold said.